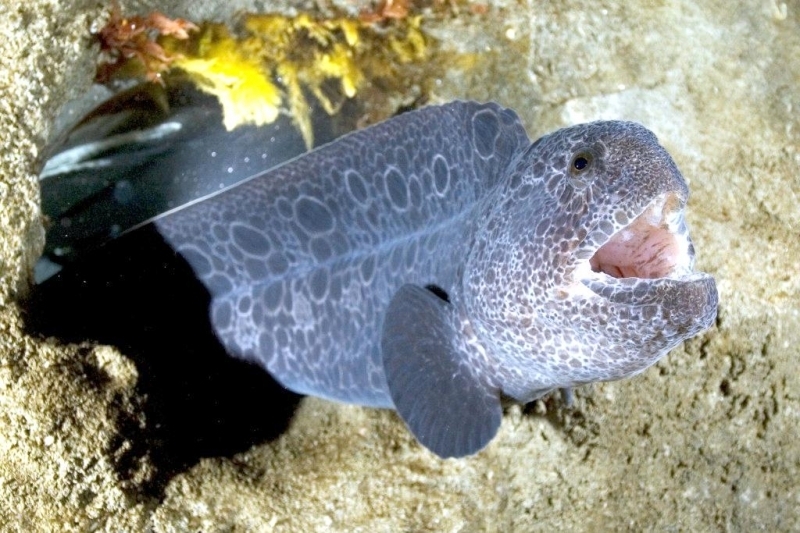 Wolf Eels look more or less normal-sized down to their neck and then their bodies just keep going, with thick, muscular waves of tail stretching nearly 8 feet behind them. 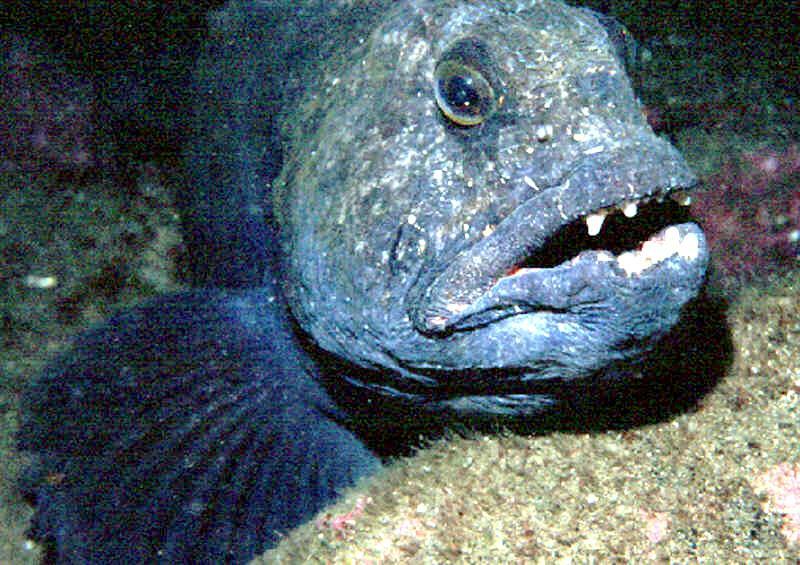 Adults wind those long bodies into caves & crevices, sticking just their heads out and waiting for something crunchy to swim by. 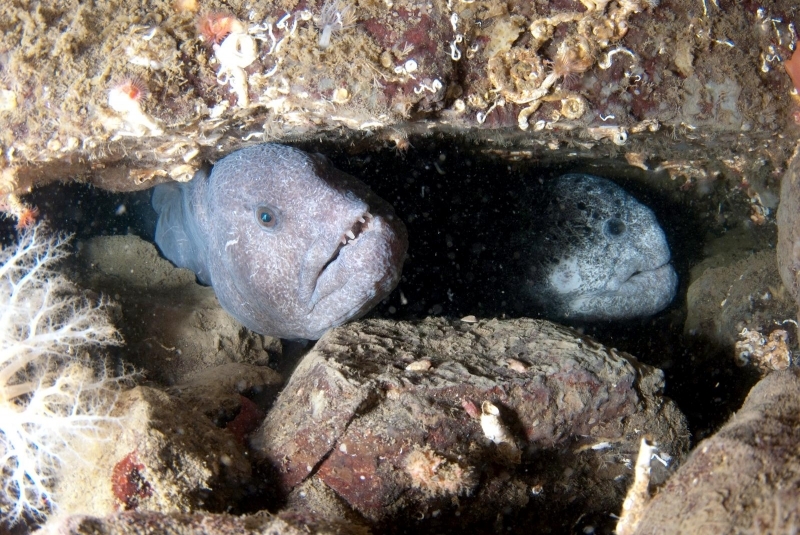 They love to eat crabs, urchins & shellfish and are not “eels” in the true sense of the word. 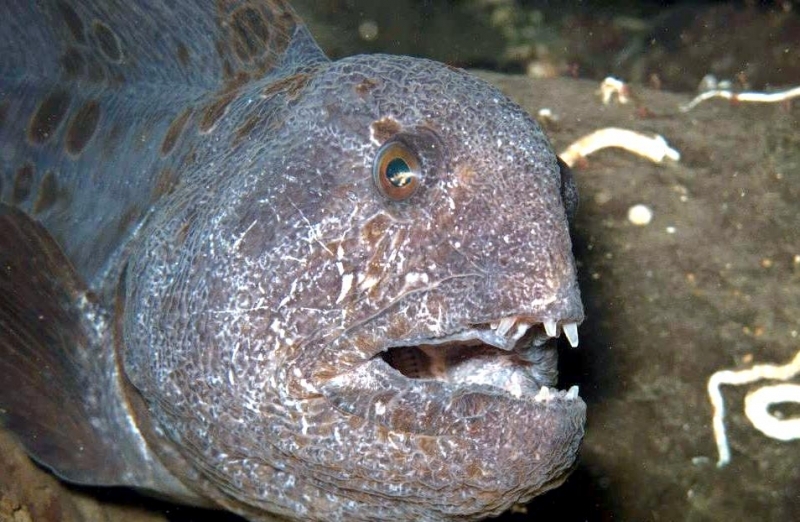 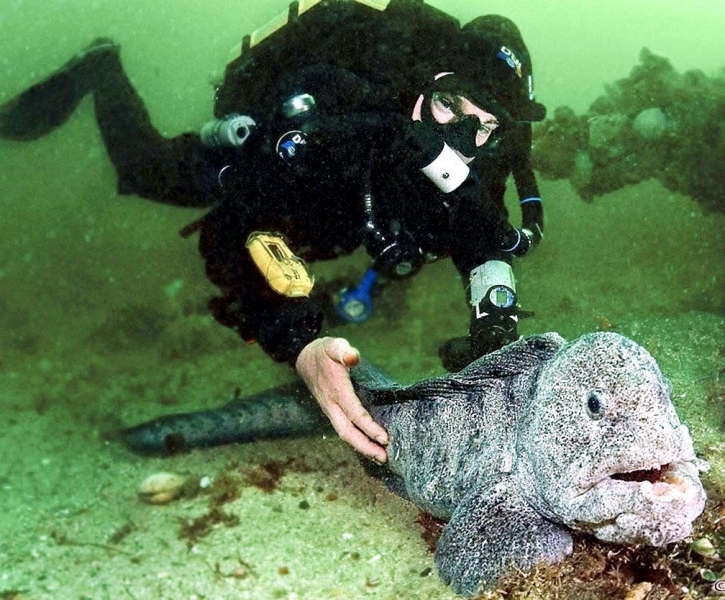 Wolf Eels occur in shallow water to as deep as 740 feet. 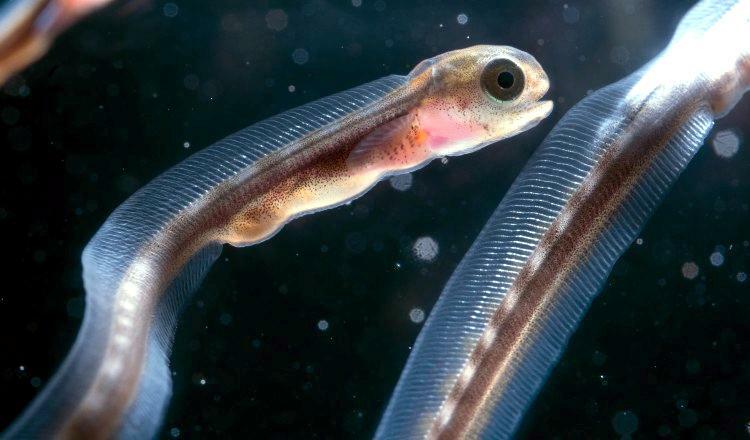 They swim by making deep S-shapes with their bodies, like a snake moving across the ground. 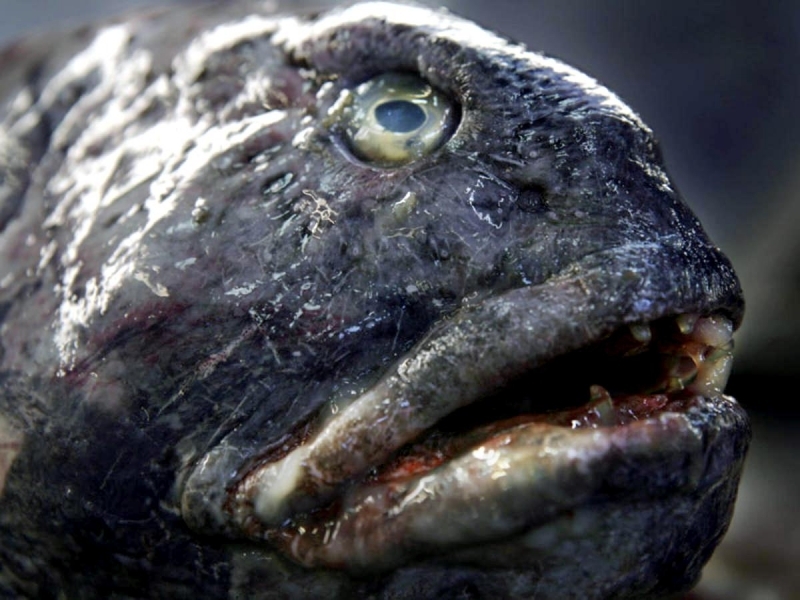 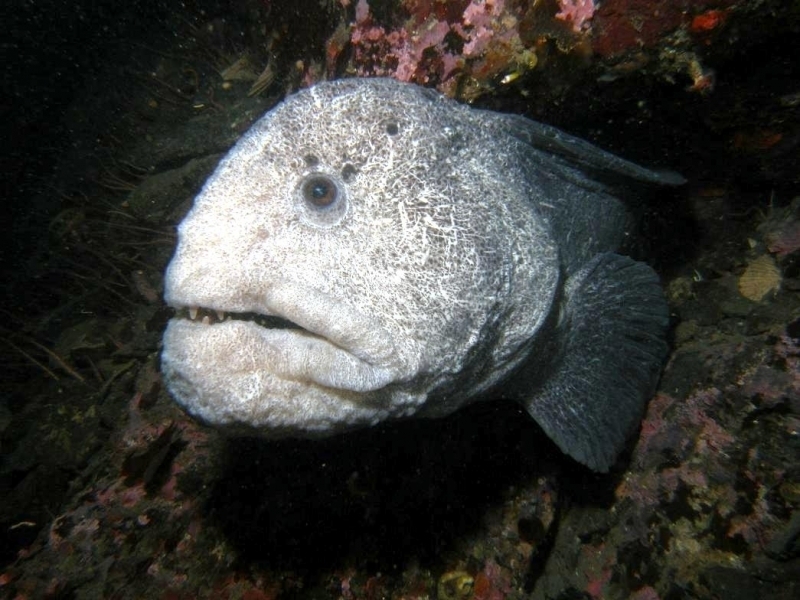 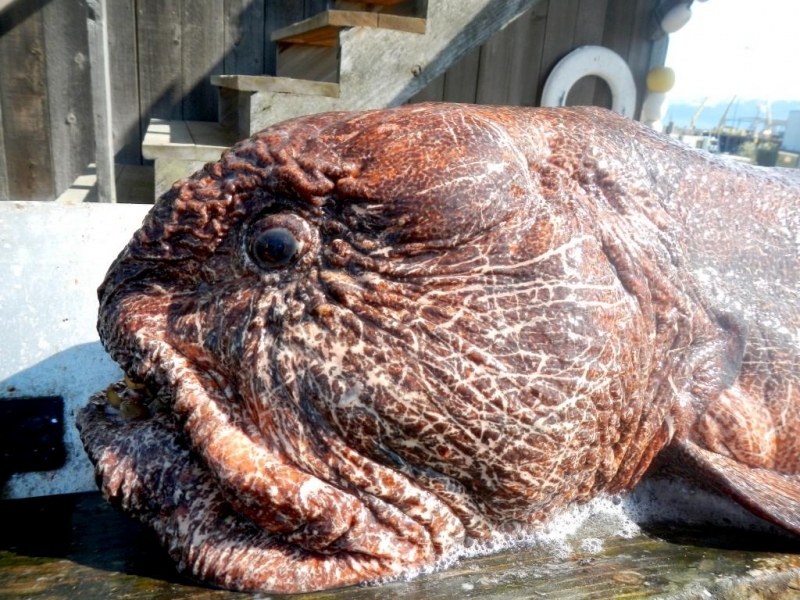 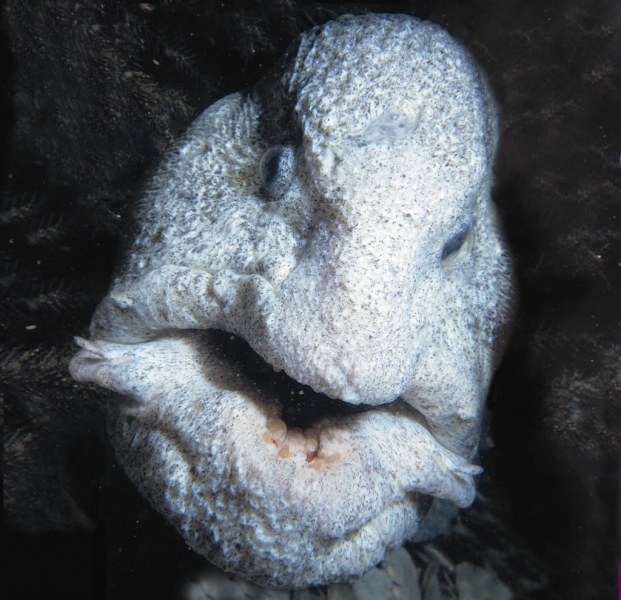 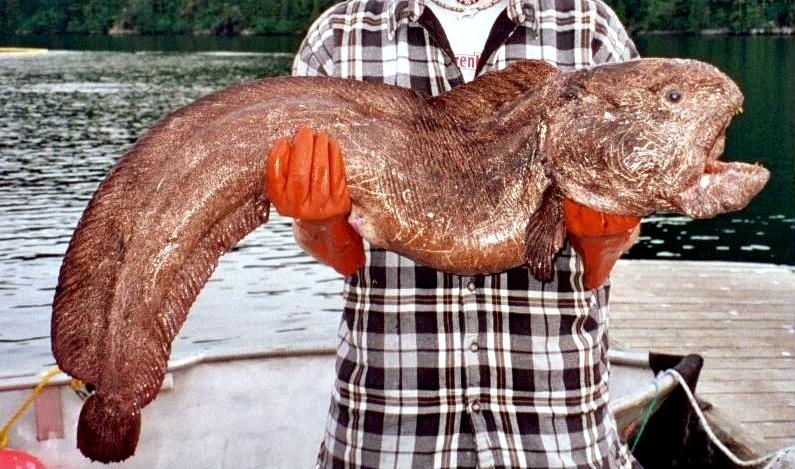 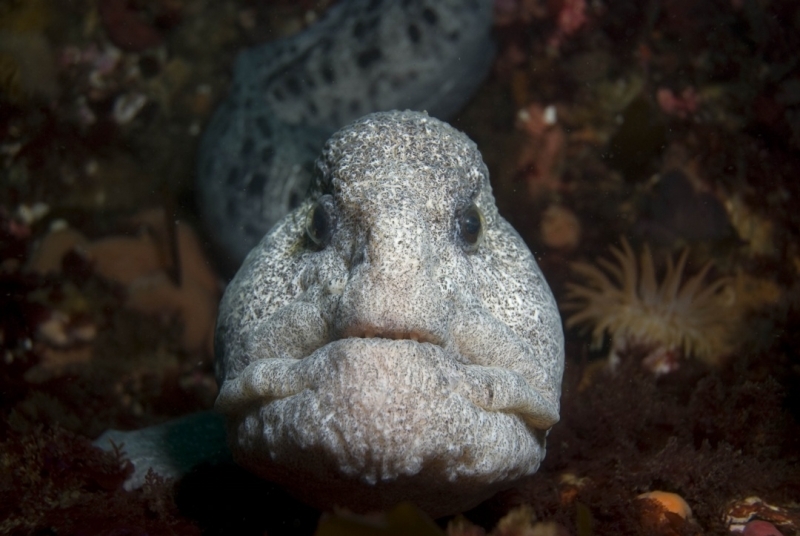 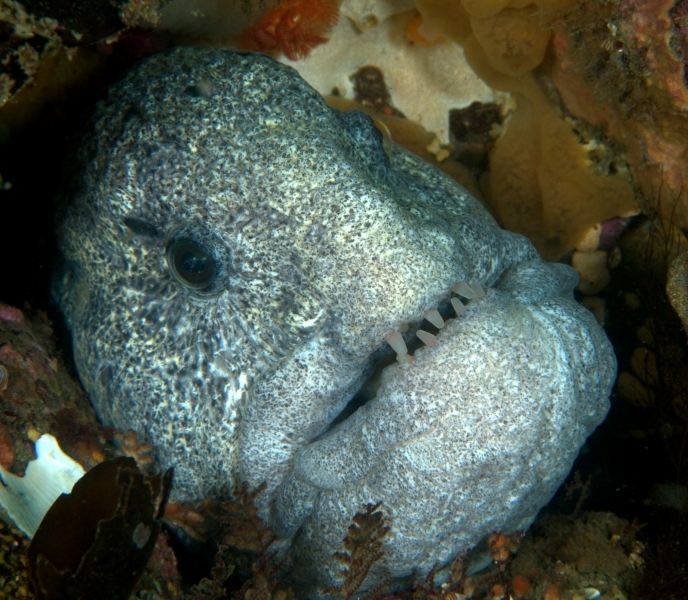 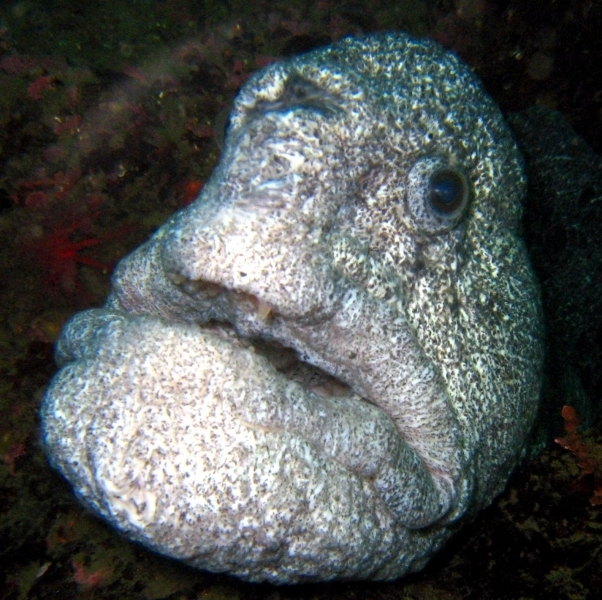 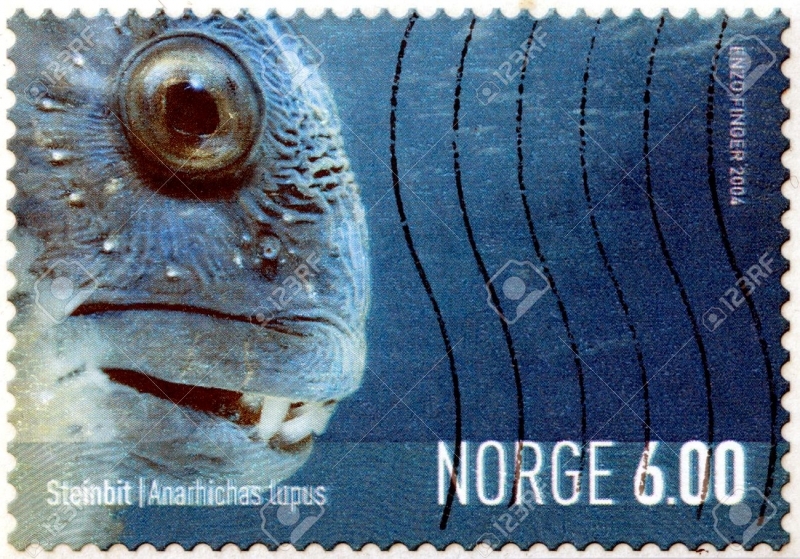 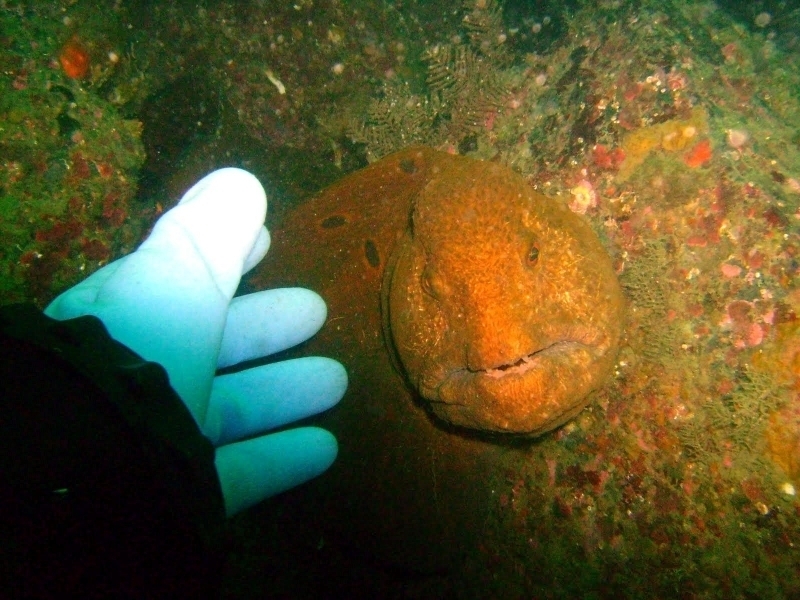 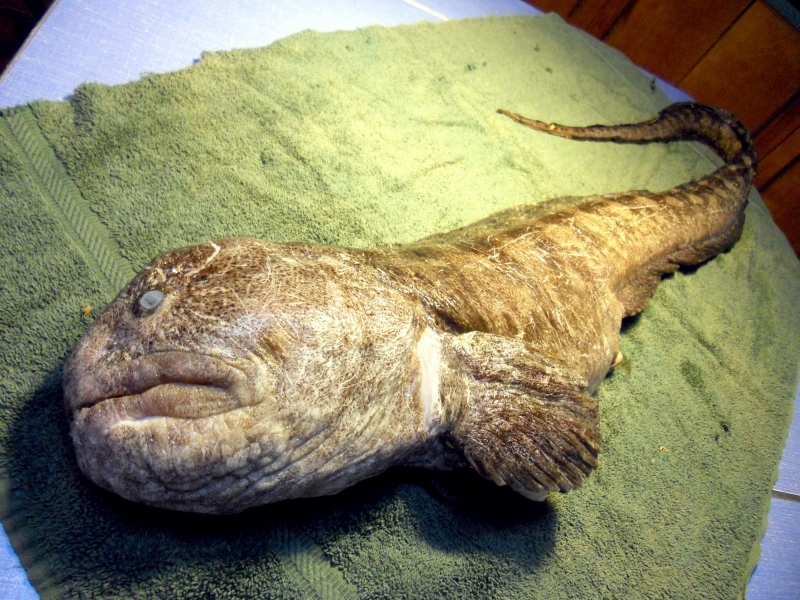 Its name originates from the greek word Anarhichas, a fish in which the Wolf Eel resembles and the latin word ocellatus which means eye-like spots. 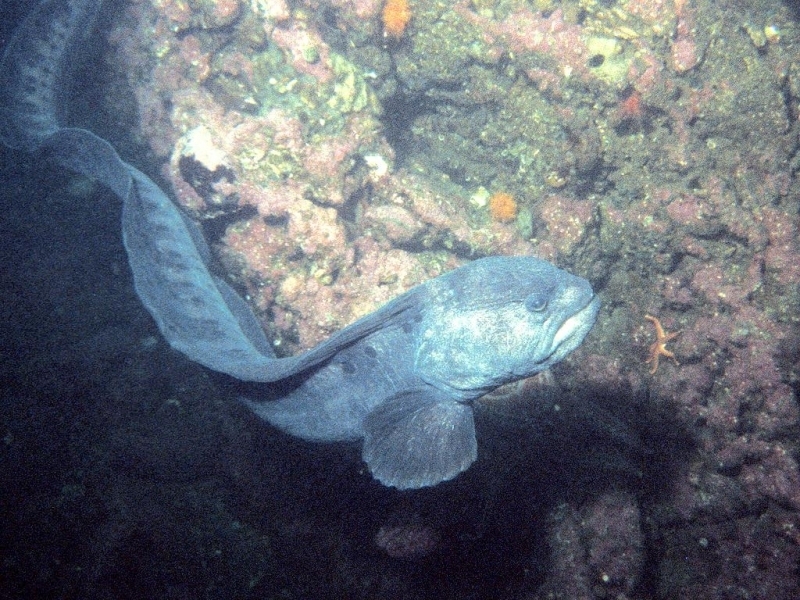 This slender fish is gray as a rain cloud, with large heads and dark spots over their backs. 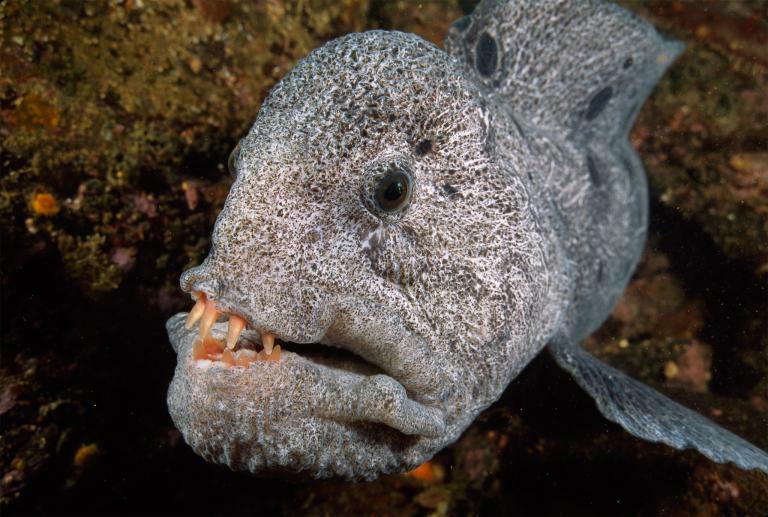 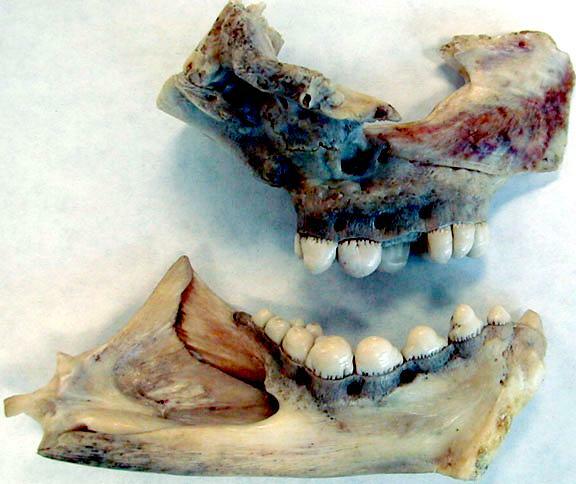 Males have thick jaws and a bulging forehead. 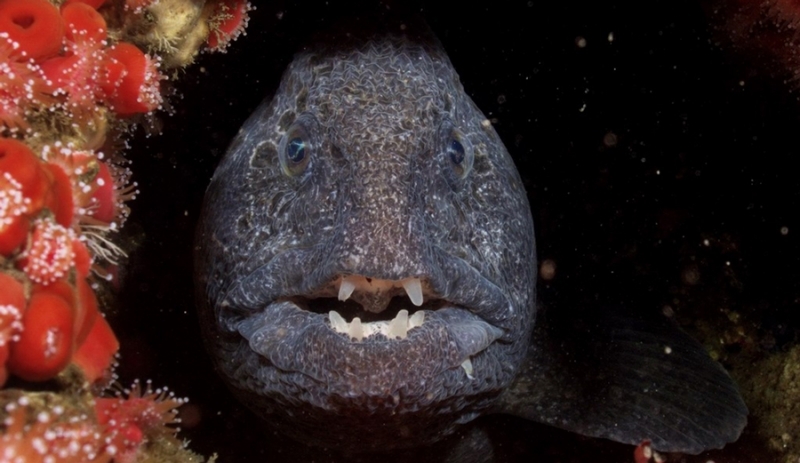 Combined with their long, snaggly front teeth they look ferocious, but Wolf Eels tend to be aggressive only to other Wolf Eels. 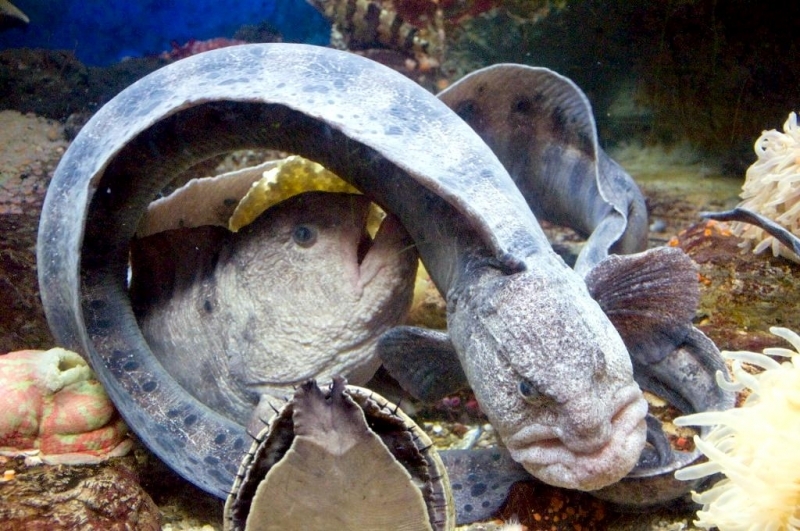 They mate for life and the pair takes special care of its eggs as they develop. 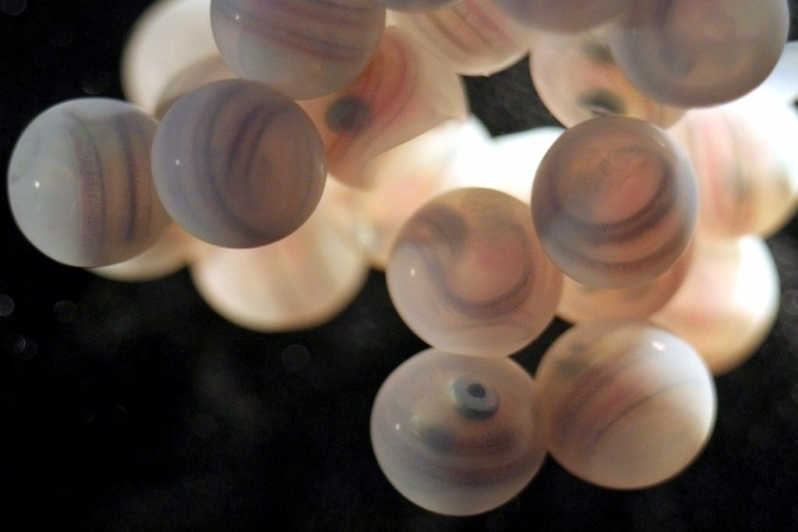 Beginning around age seven, the female lays up to 10,000 eggs at a time, then coils around them and uses her body to shape the eggs into a neat sphere roughly the size of a grapefruit. 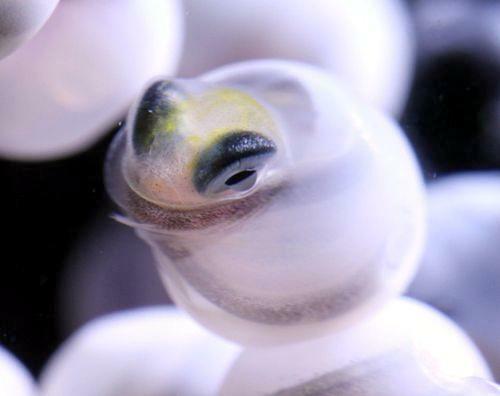 When she’s settled, the male coils around her as an added layer of protection. 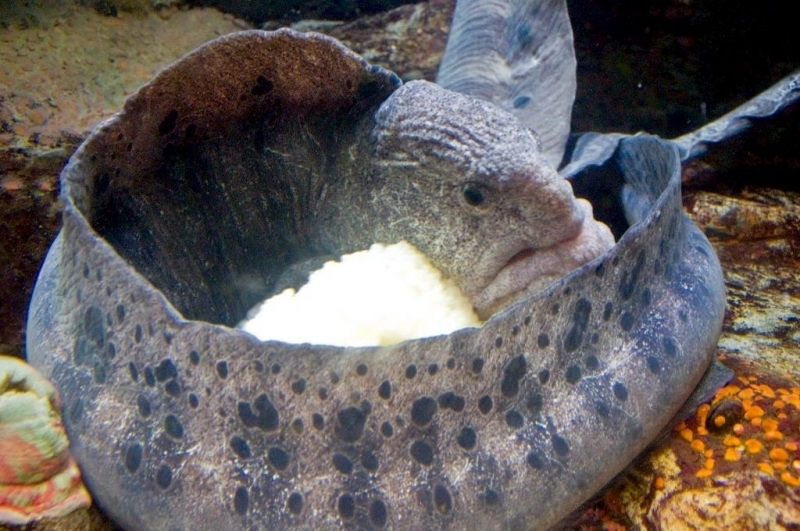 The female continues massaging the eggs periodically as they develop, helping to circulate water around the eggs to keep them supplied with oxygen which take about four months to hatch. 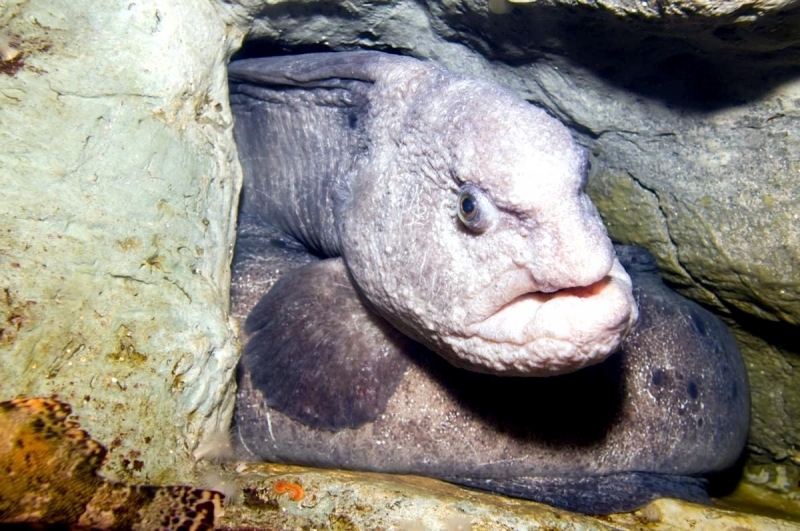 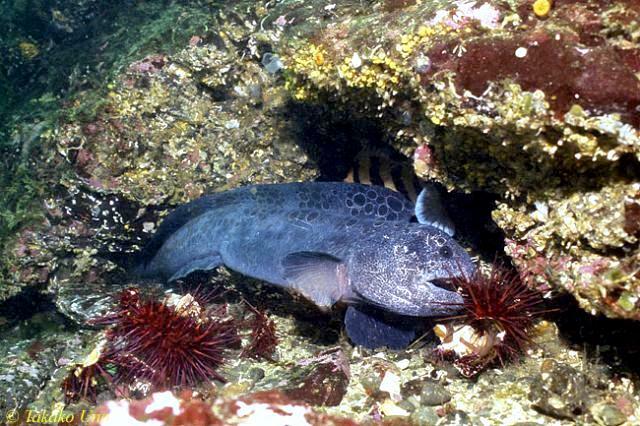 Though adults are nearly always found around shelter, the Wolf Eel spends its early life in open water. 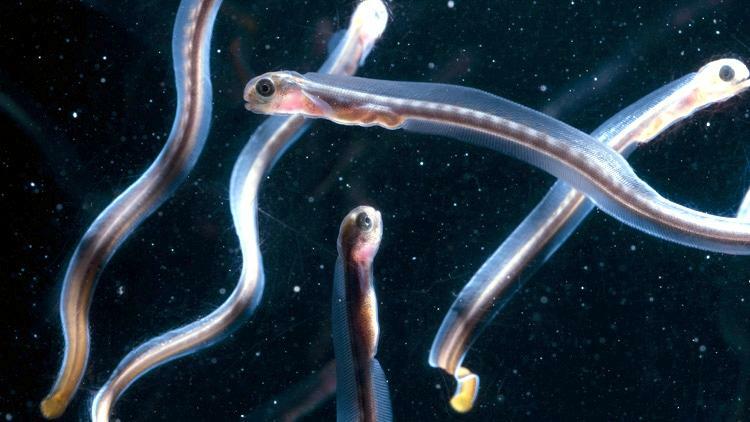 After eggs hatch, the little 1.6 inch larvae float away on currents, eating tiny animals including copepods & other zooplankton. 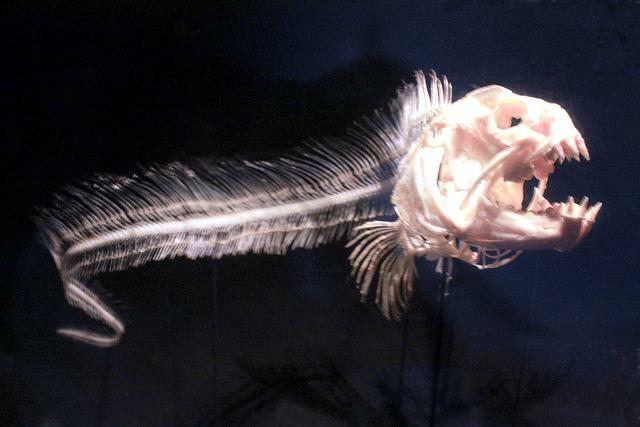 Next they enter a free-swimming “pelagic” phase which they spend in the middle depths of the ocean. 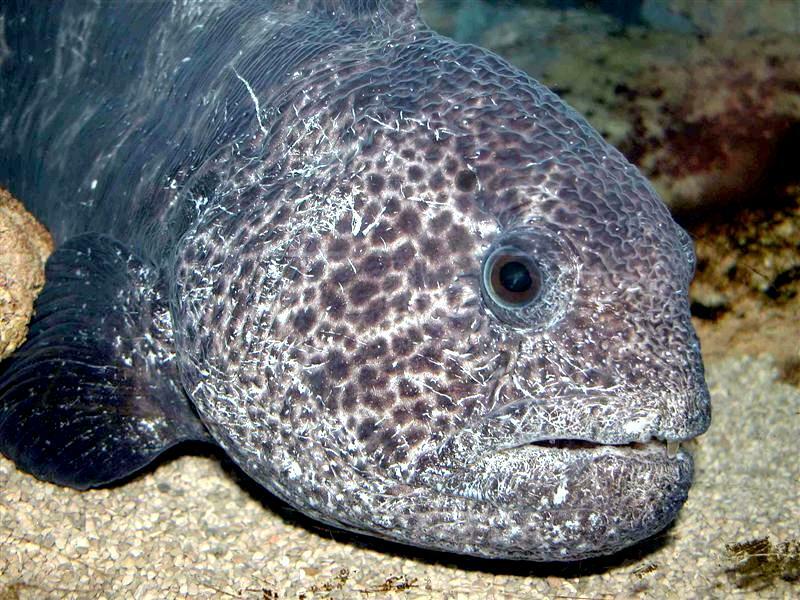 As the juvenile Wolf Eels mature into young adults, they move to shallower water & wander the sea bottom looking for food. 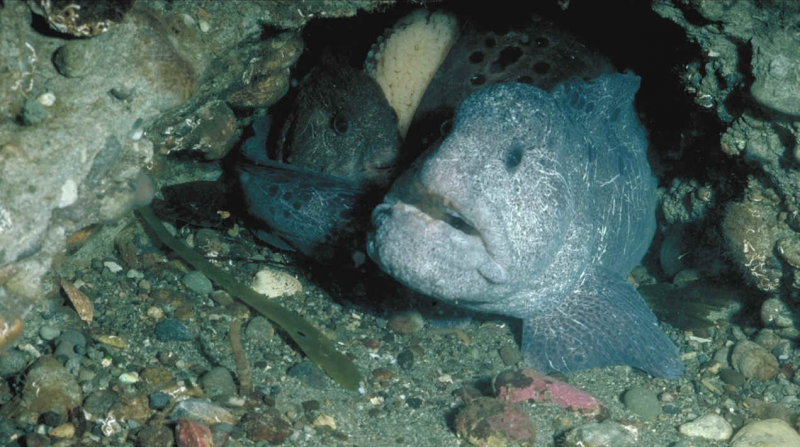 Once they find a mate and a suitable hideout in a rocky reef they settle down, typically to spend the rest of their lives there. 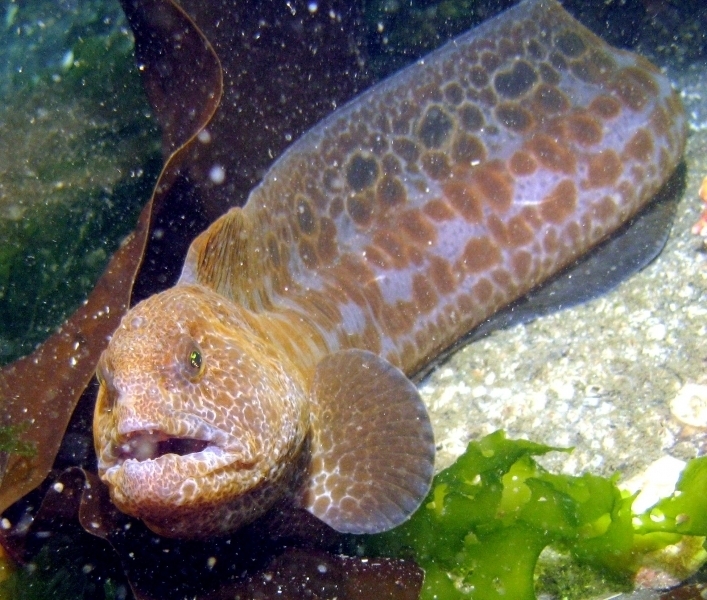 Young Wolf Eels wear an attractive bright orange that fades as they mature. 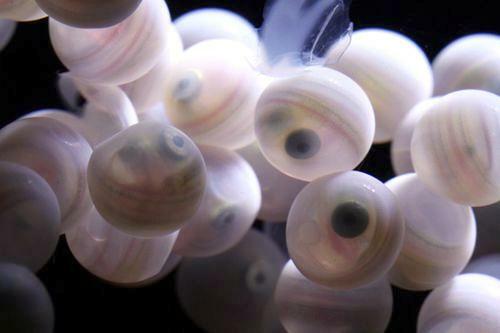 Even in their first few days of life they are hunters, watching the water for drifting prey. 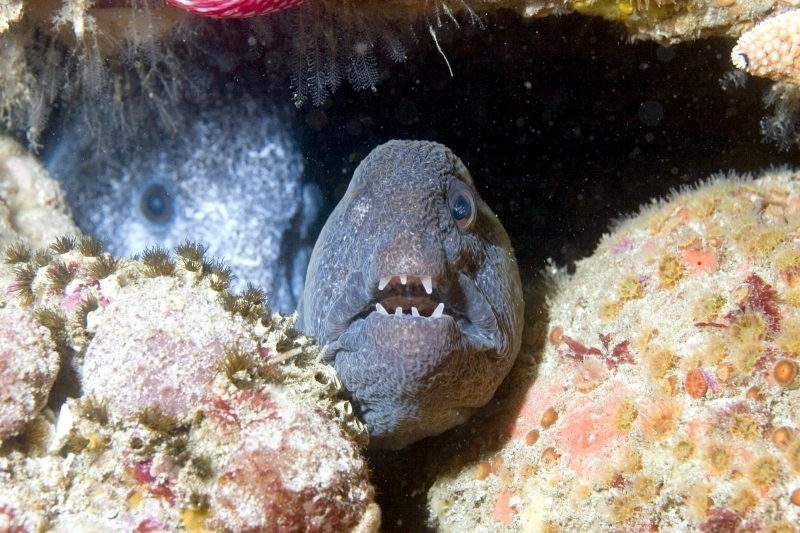 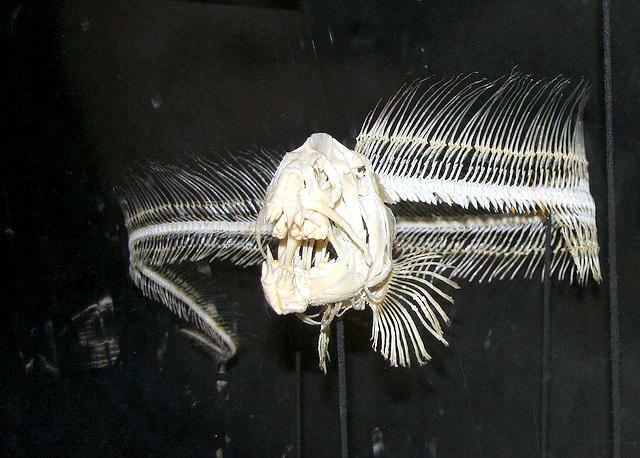 To strike, the little Wolf Eels bend their tiny bodies into a sideways S-shape and then lunge at their prey. 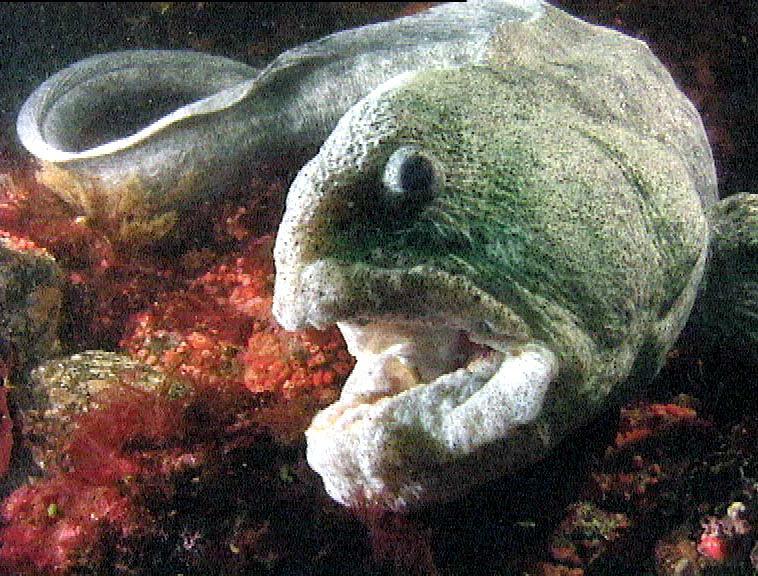 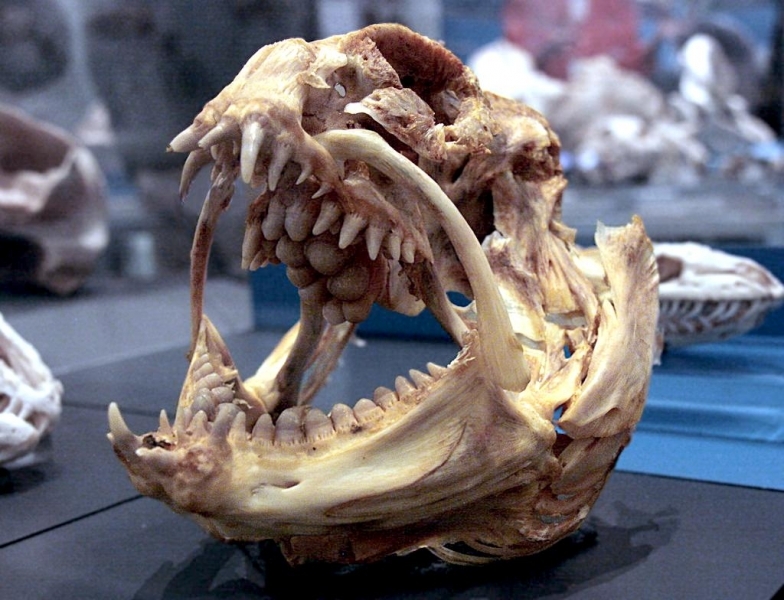 Young Wolf Eels don’t have the powerful molars that adults use to crush shellfish; they stick to catching fish with their long canine teeth. 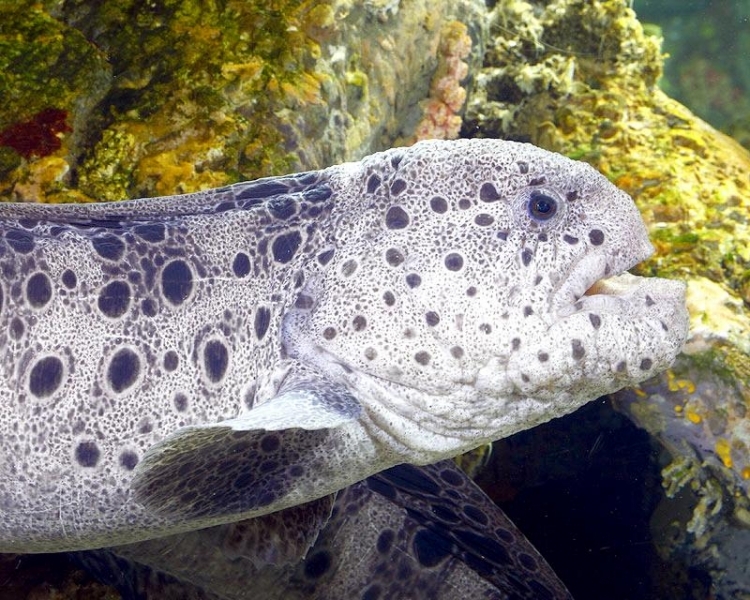 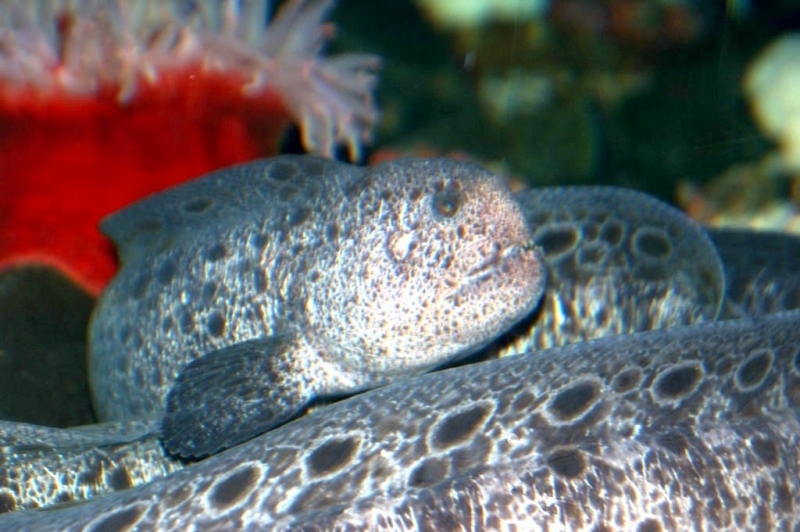 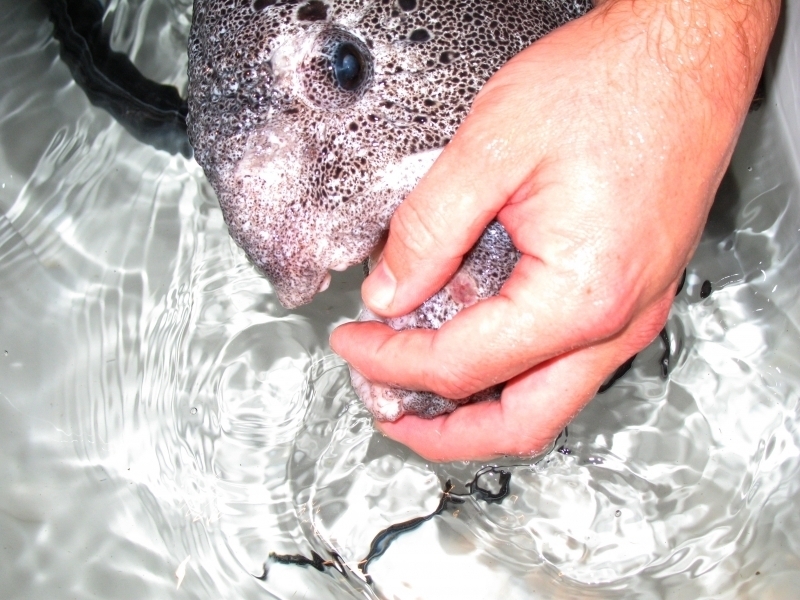 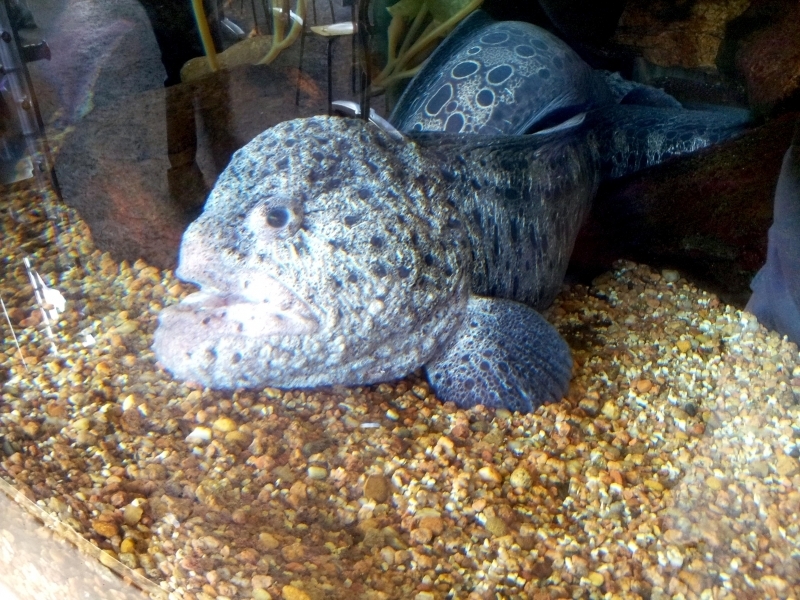 In the wild, Wolf Eels eat hard-shelled animals like crabs, sand dollars & sea urchins. 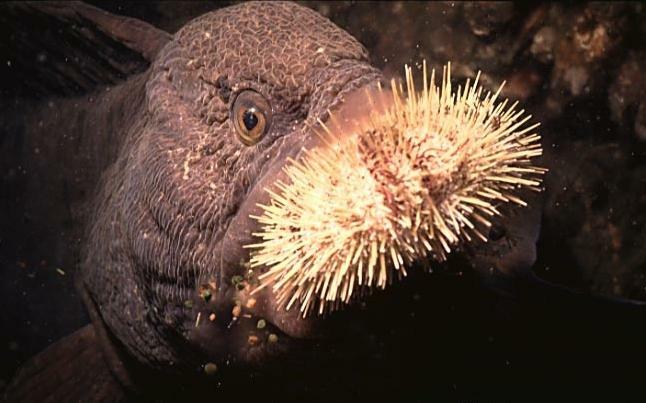 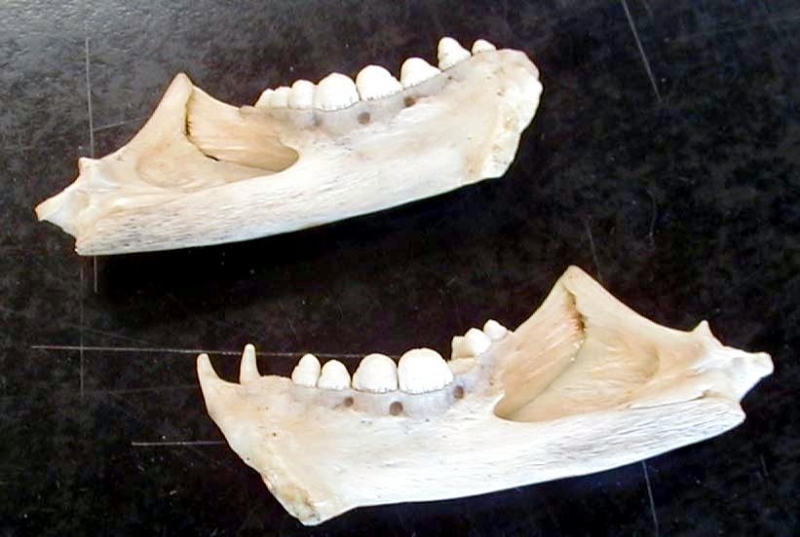 They grab these in their jaws and use the broad molars in the back of their mouths to crunch through the shells. 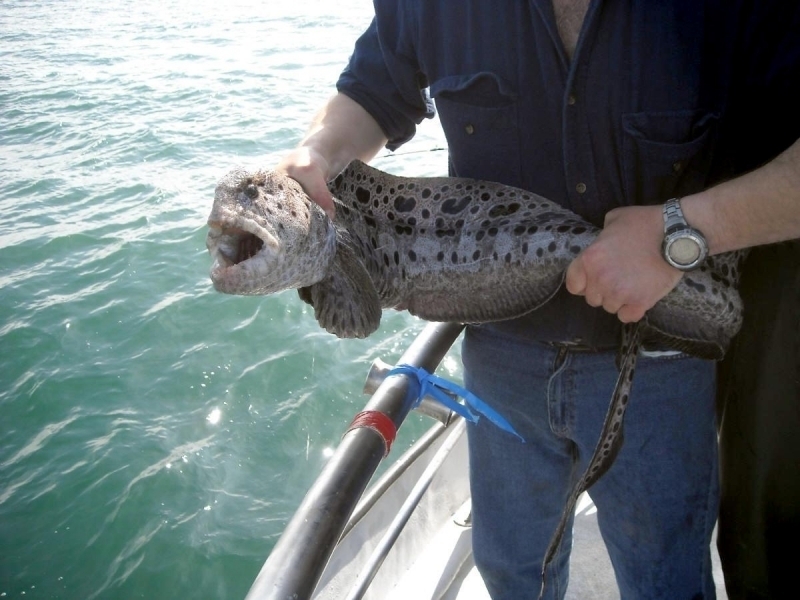 At all ages they seem to have great appetites. 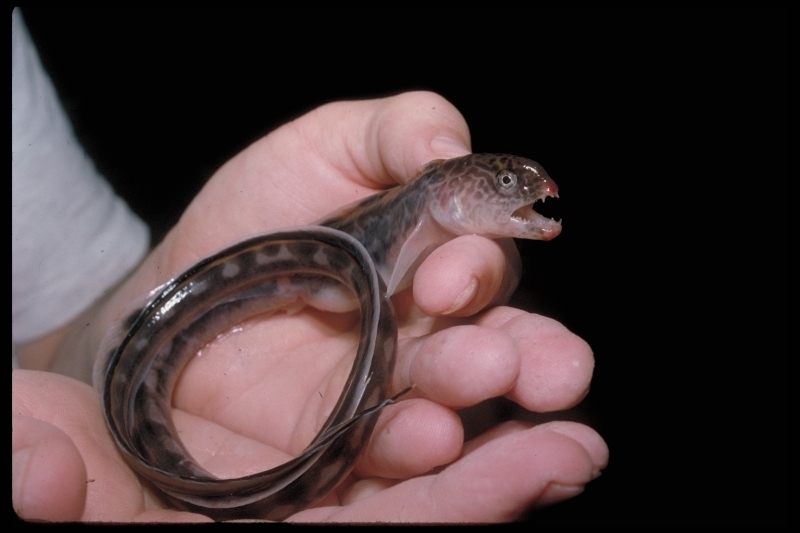 Baby Wolf Eels in captivity may eat up to 100 herring larvae at a time. 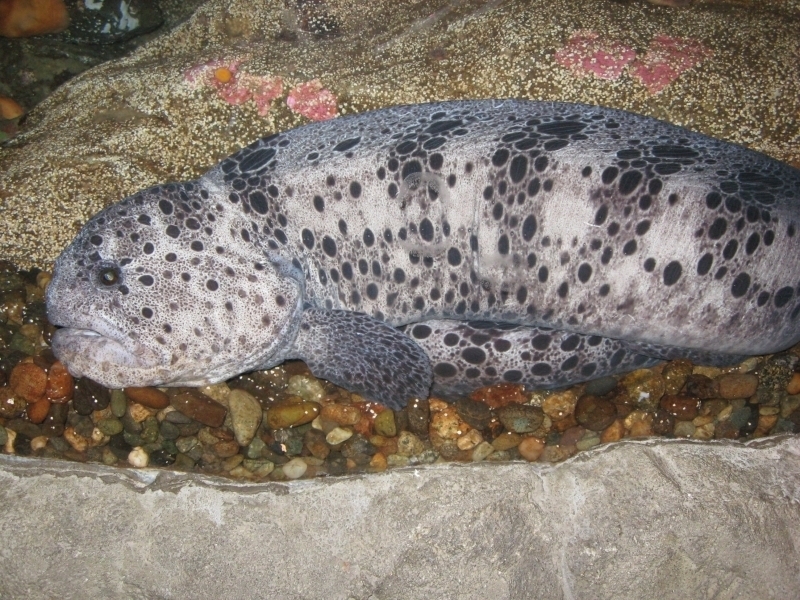 Captive Wolf Eels in their bottom-wandering phase of life, have eaten as many as 24 Dungeness Crabs in a single day. 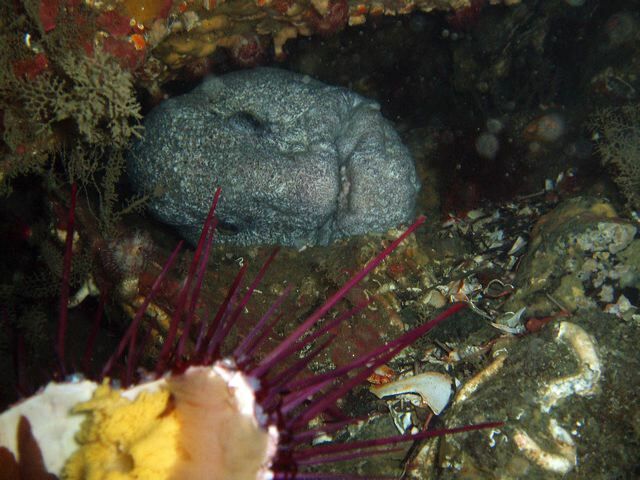 You might not think many animals could threaten an 8 foot long fish that lives coiled inside a jumble of rocks with only its fearsome snout poking out but Harbor Seals can. 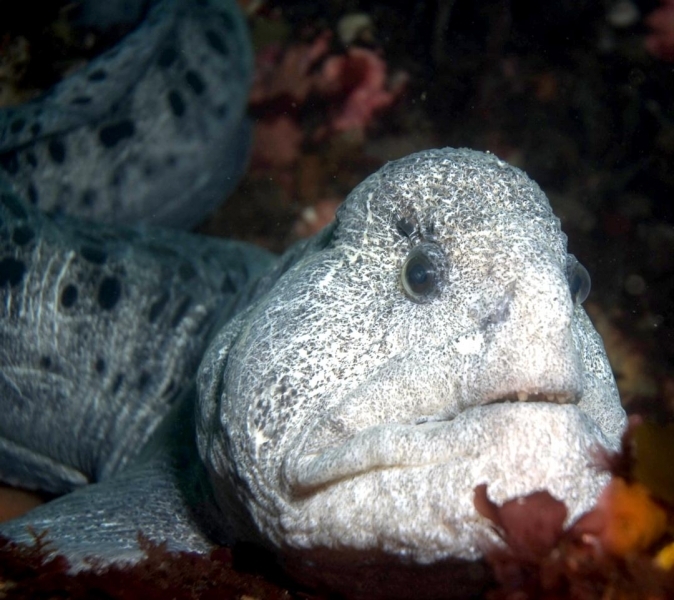 A trio of Marine Biologists filmed a Harbor Seal in 1988 at Point Lobos about 10 miles south of Monterey, surface with a live Wolf Eel wriggling in its teeth. 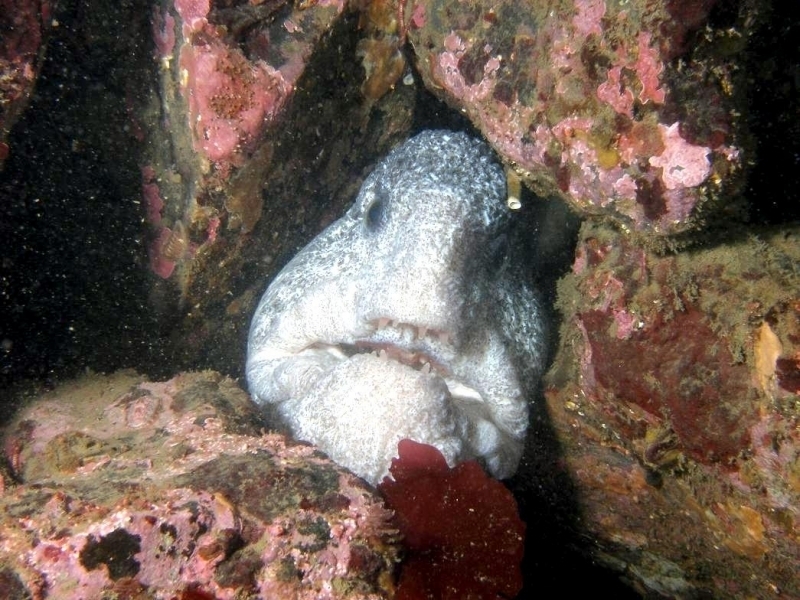 As the scientists watched, the seal subdued the Wolf Eel and ate it for lunch. 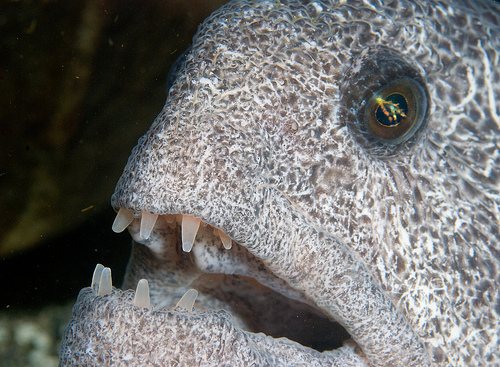 Different predators go after the young. 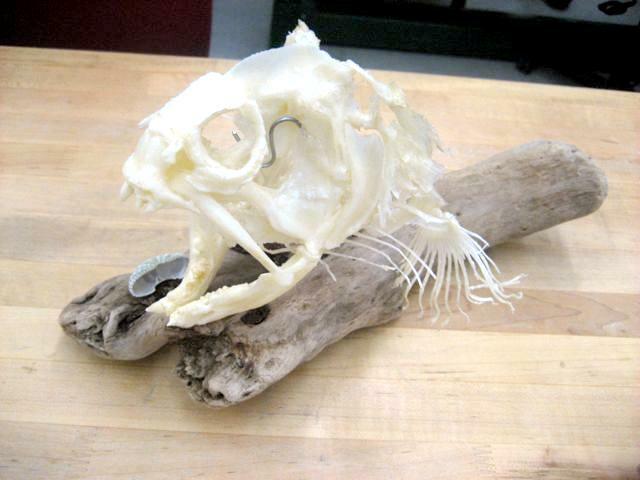 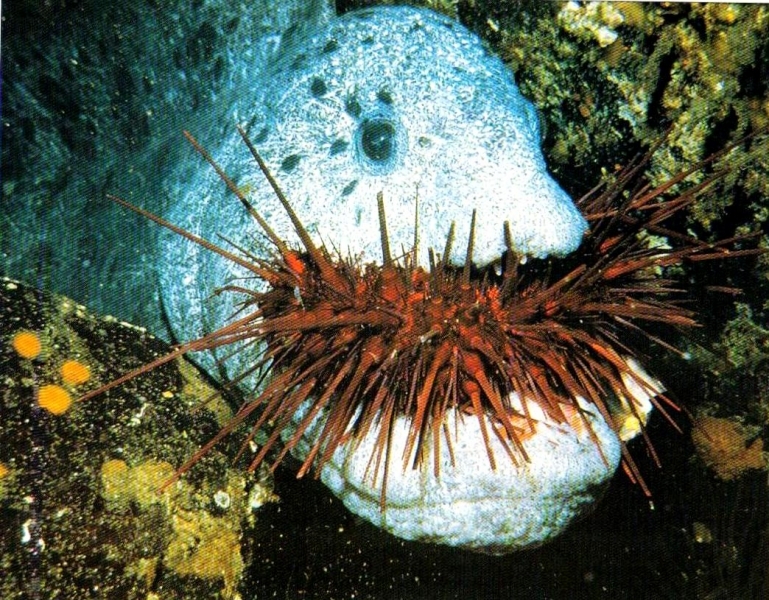 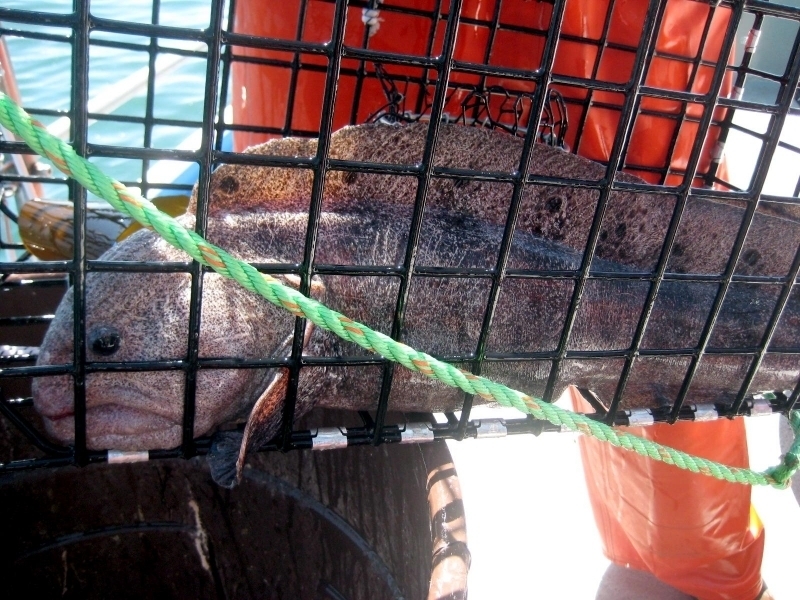 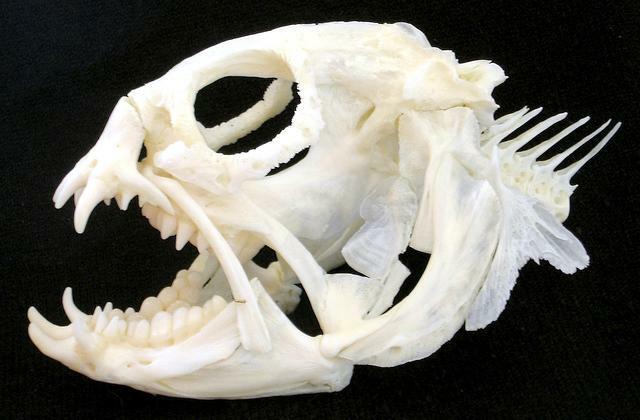 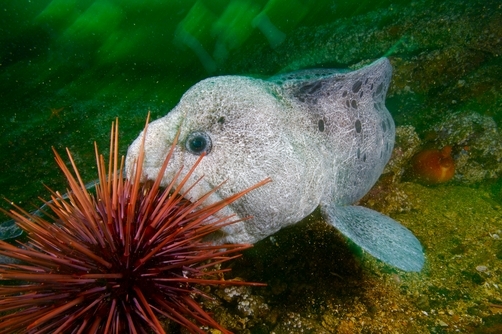 Both Rockfish and Kelp Greenling will eat unguarded Wolf Eel eggs.